Set your establishment apart from the crowd with a web domain that’s designed to get people ready for fun. The .bar domain is a generic top-level domain that was delegated in 2014. Since its creation, this recognizable domain has been the go-to for social venues across the world. It offers a distinct branding, built-in marketing opportunities, and a host of other features that you couldn’t get with a traditional .com extension. Whether you own a cocktail bar, restaurant, event venue, or beauty salon, the .bar domain can help to establish your company as a leader in your industry. The word “bar” has a number of different meanings. While most people associate it with venues that serve drinks in a social environment, it’s also applicable to a number of other industries. The .bar domain is a versatile option that can help attract visitors to your digital space. Regardless of your industry, the unique extension is a colorful alternative to the standard extensions that everyone else has. In our heavily connected world, having an established online presence that’s distinct is crucial. A .bar domain can help you do just that. Web users are naturally drawn to innovative URLs. A .bar domain tells the world what your company is all about from the get-go. It’s a natural attention-grabber that can ultimately become a huge part of your brand’s identity. The domain also serves many practical purposes. It can help to improve your search engine rankings through organic optimization. People searching for bars in your area will typically incorporate the term into their search queries. Because the word “bar” is a part of the extension, your URL will pop up, helping to drive traffic to your website. There are countless ways to utilize the .bar extension for domain hacking. Domain hacking involves creating short, memorable phrases out of your URL. These clever web addresses can then be used beyond the realm of the Internet. Slap it onto some fliers, business cars, or signs, and you have a quick marketing campaign that can be used to help your business grow. The easiest way to use the domain is to simply incorporate your establishment’s name. For example, Companyname.bar is short, sweet, and easy to remember. Alternatively, you can use geography tags to further enhance your SEO results. One example would be CityName.bar. Cocktail bars and restaurants aren’t the only ones who can use the .bar extension. Many salons and beauty parlors utilize it as well. Web addresses like Beauty.bar, nail.bar, or hair.bar tells your audience that your establishment is the place to go when they want some pampering. 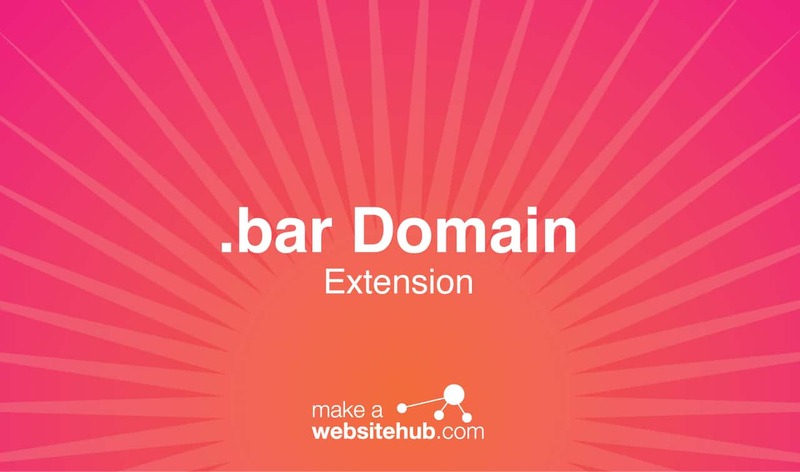 Where Can You Buy a .bar Domain Extension? Many of the most popular domain name registrars offer the .bar domain. It can be registered for up to 10 years at a time. There are also no use restrictions, so feel free to take advantage of what this domain has to offer regardless of your industry. Here are some registrars you can check out.